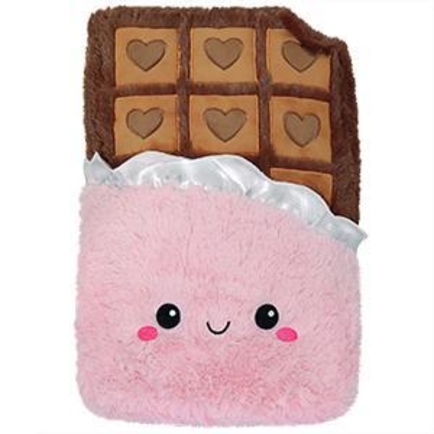 Show your love this Valentine's Day with this lovable Squishable heart-covered chocolate bar. Order 6 and receive free shipping for these items! Did you know it takes 400 cocoa beans to make one pound of chocolate?? Haha, woah! That's a couple! Imagine how many beans it would take to make a chocolate bar that's Squishable size? Probably a LOT. Thankfully, THIS chocolate bar is made of magic and happiness and generally good vibes! Well, and also stuffing, and faux fur. So it's like chocolate, with less beans and more fashion sense! 15 squishy inches of confectionary delight! All new polyester fiber, ages 3 and up!